Madame Tussauds is the most famous wax museum gallery in the world, with more than 400 life-sized models of stars, famous politicians, royals, comic book characters and sportsmen, as well as exhibits presenting the most infamous criminals the world has known. Inside the museum, the 'Spirit of London' ride will take you through the city's history, introducing you to those figures that have shaped the London of today, while the 'A-list Party' section will introduce you to the museum's collection of celebrities, and the 'Scream' exhibition will terrify and delight visitors in equal measure. 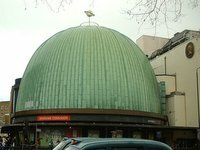 A must-see tourist sight in London, visitors are advised to book their tickets online in advance, as the queues for tickets outside Madame Tussauds can be very long. Opening times: Open daily 9.30am to 5.30pm (9am to 6pm on weekends and during UK school holidays). Admission: £35 (adults), £30 (children). Note that you can save substantially by booking online.